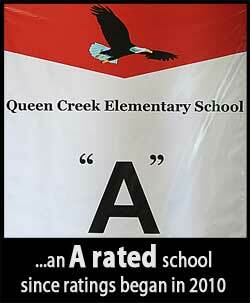 Why Queen Creek Elementary School? Welcome to the Internet home of the Queen Creek Elementary School Eagles. We’re happy you’re here! Your involvement in our school and in the education of our students helps them to continue to reach their goals and soar to great heights. You will feel our pride in excellence and our excitement for learning as you browse the pages of our website. Queen Creek is located about 50 miles southeast of Phoenix, Arizona. Our town is one of the fastest growing towns in the state of Arizona; yet drawing on its rich, rural roots, it maintains its strength as a well-planned, family-oriented community. 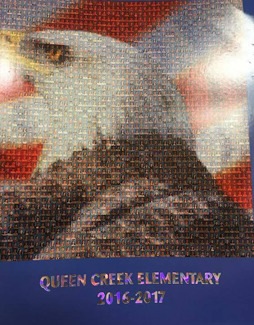 In keeping with that tradition, our Pre-K–5th graders at Queen Creek Elementary School have a strong sense of family values and excellence as well as a sense of vision for a successful future. They know that it takes hard work to succeed—and our Eagles are not afraid of hard work! They strive for excellence in all they do, and we are proud of them. At Queen Creek Elementary we are proud to provide an exceptional learning experience where we strive to create lifelong learners who are motivated to meet their greatest potential. We believe that working together is the key to success for our students. A collaborative effort of parents, community members, and staff contributes to the overall success of the students and the school, thus enabling us to achieve our mission. At Queen Creek Elementary, we are committed to providing a positive environment that promotes self-worth for all students and their individual differences. Our students are continually challenged by the high expectations and quality curriculum that our staff provides. Formative: This is a five-question assessment we give to our students after they have learned a new standard. The purpose of this assessment is to help give both the student and the teacher an idea of how close the student is to meeting mastery. We use it to guide our instruction and ensure that we provide reteach/enrich at the student’s individual need. First through fifth grade students participate in formatives. Benchmark Testing: This is an assessment that is a culmination of all of the standards taught throughout the quarter. There are five questions per standard. For our third through fifth graders, we make sure to model the process and procedures after AzMERIT so we can best prepare them for the end of the year exam. In the areas of writing, math, and ELA, this practice is for second through fifth graders. Kindergarten and first grade students take a writing benchmark. DIBELS: This is a very short regular assessment of early reading and literacy skills. Our goal is early identification of children who have difficulty with these skills, so we can provide the best support in their learning journey. If you would like to know more about DIBELS, please visit the Dynamic Measurement Group website page, What are DIBELS? Little Coyotes: Please check with your child’s teacher. We provide student supervision starting at 7:45 a.m.